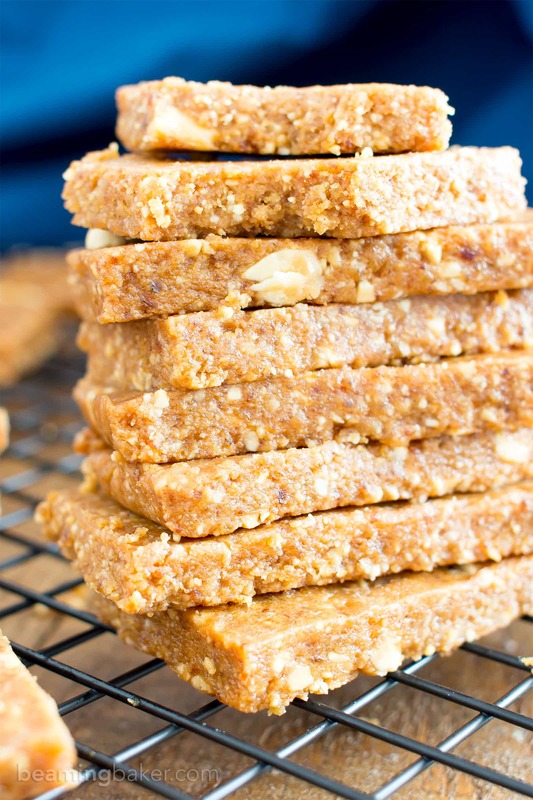 4 Ingredient No Bake Peanut Butter Cookie Energy Bars (V, GF, DF): an easy recipe for simple salty ‘n sweet energy bars that taste like peanut butter cookies! 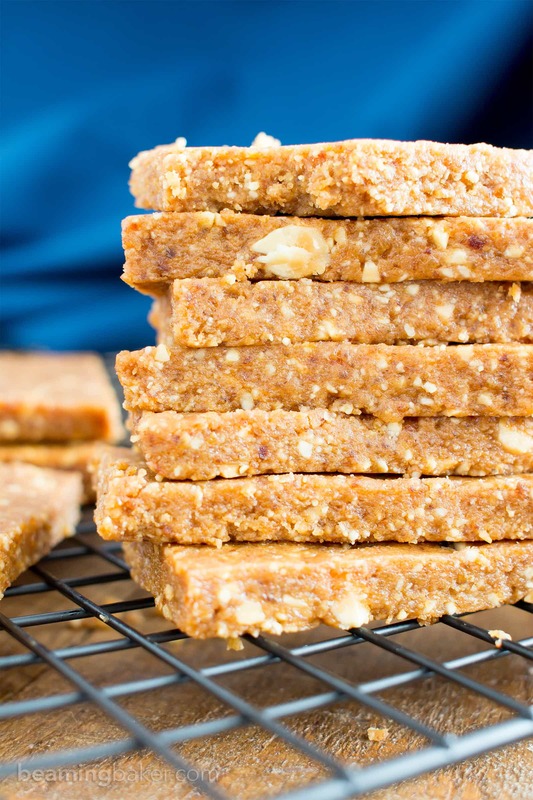 Vegan, Gluten Free, Protein-Packed, Dairy-Free, No Added Sugar. Happy Birthday PB, aka Dylan!!! It’s that time of the year, when we all celebrate my little nephew’s and my sister’s (his mama’s) birthdays. Oh, all right… not everyone is celebrating their birthdays. But why not? And if that doesn’t work, he’ll totally cry on cue. Not that he’s learned to do that yet or anything… Okay, now Jenny’s giving me the stinkeye. Quick, someone change the subject! There, it’s all better now. 🙂 Why is it that peanut butter fixes all of life’s problems? 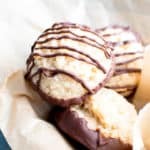 (As previously discussed in no bake peanut butter coconut bites, of course.) Or at least the most edible of life’s problems? I don’t even know what that means, but let’s go with it. Let’s just say we’re working with 4-year-old logic today. No offense, PB. Yep, we’re a family of logicians. Is that a real thing? Quick, someone look it up! You might say that something has gotten into me today… or perhaps I’m always like this. 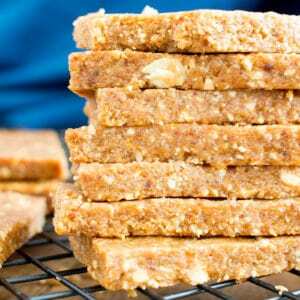 Hard to say since I just got done eating like 3 of these 4 Ingredient No Bake Peanut Butter Cookie Energy Bars. They are called energy bars, after all. 😉 Something about that tasty combo of peanuts, dates, and even more peanuts… it’s beyond invigorating. Anywho, for now, we’ll just call the little guy PB2. 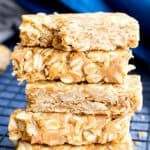 That way folks who are reading this post can get really confused and ask if these 4 ingredient no bake peanut butter cookie energy bars can be made with PB2. The rest of us folks who actually read/wrote this post can quietly snicker about their ignorance. <– Alright, these energy bars apparently make me sassy, too! Ahem. It feels like just yesterday that I was holding PB in my arms, right after he was born. He was no larger than a large burrito. Okay, fine, a “small” burrito in my family. 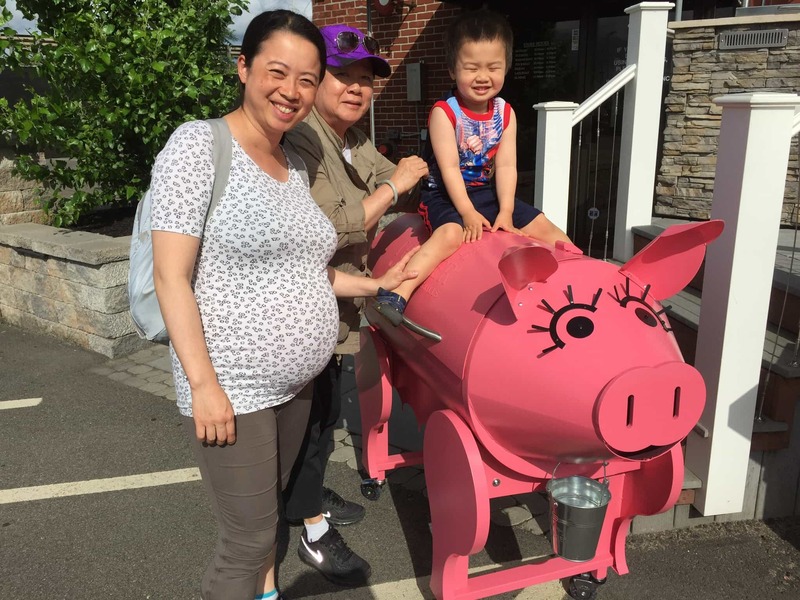 So… he was no larger than a banh mi. He was so tiny and couldn’t even open his eyes yet. 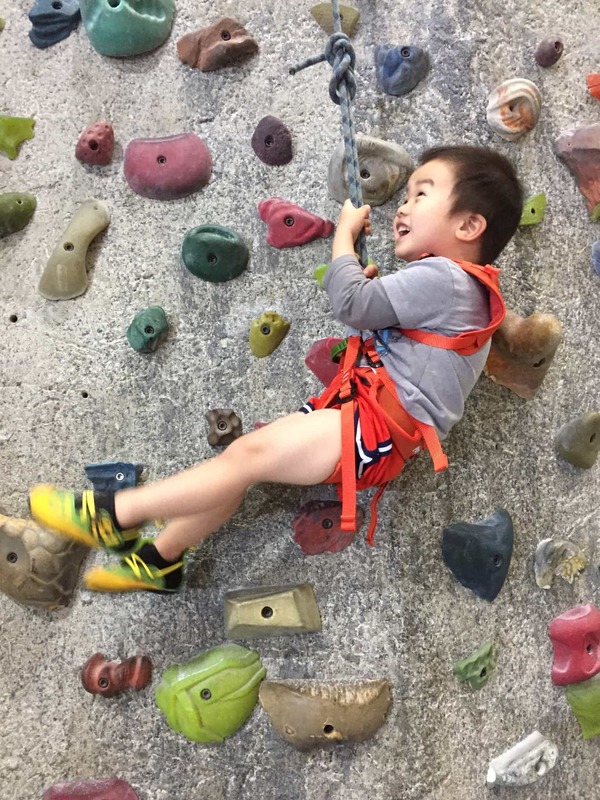 He was bright red everywhere and could already wiggle his eyebrows to express every need (food, bathroom, nap, more food, more bathroom, longer nap). The second he was born, Erik and I ran all over town, frantically looking for a store that would sew his name onto this miniscule knit cap so we could present it to his mama. She, of course, wouldn’t give us the name until the little guy popped out. The teeny, tiny cap was even a bit baggy for his head. ???? And today, he’s much larger than a small burrito. In fact, he’s even larger than 10 banh mi stacked up (see photo). ???? Gosh, I’m hungry. He runs around telling everyone that he’s a big boy. He’s got all kinds of sassy sayings like, “you’re Mr. Tooty!!! !” And we’ll say, “what’s that, Mr. Tooty?” And he’ll be like, “No, you’re Mr. Tooty! !” And then we’ll be like, “Stop saying Mr. Tooty, Mr. Tooty!! !” And then we’ll all wonder where this Mr. Tooty even came from. He’s got opinions and even a Spiderman watering can for his garden. Yep, he has a garden!! It gets me all mushy thinking about how fast he’s grown up. And, how life goes at warp speed. We’ve totally got to stop working so much and just make time to enjoy life, ya know? And, and it makes Erik and I think, we’ve got to look more into this Mr. Tooty business. Where did that fool come from?!? seriously no added sugar, no refined sugar! dedicated to a super special little sir, my sweet, but totally sassy 4 year old nephew, PB! 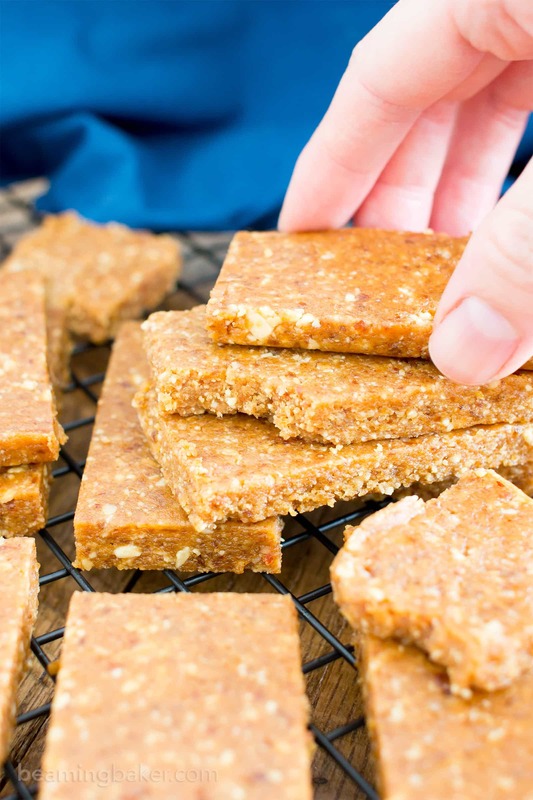 What no-added sugar treat would you like to see next? 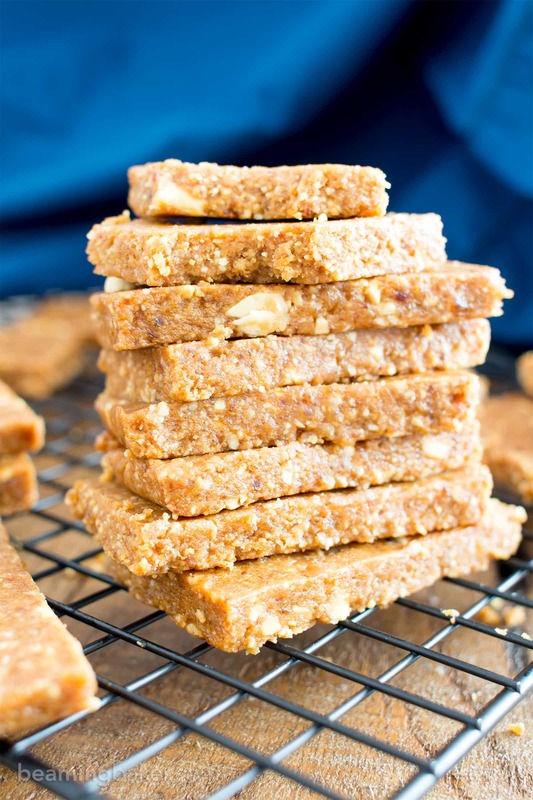 4 Ingredient No Bake Peanut Butter Cookie Energy Bars (V, GF, DF): an easy recipe for simple salty ‘n sweet energy bars that taste like peanut butter cookies! Vegan, Gluten Free, Protein-Packed, Dairy-Free. 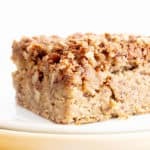 Line a 9-inch square baking pan with parchment paper, greased foil or wax paper. Set aside. 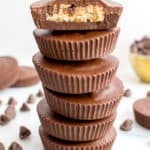 Add dates and peanut butter to a food processor. Blend until you get a somewhat cohesive, sticky and crumbly mixture, like chunks of wet sand/dough. This will take about a minute. Scrape down the sides of the processor as needed. Add in peanuts, vanilla and salt (if using). Blend until the peanuts are fully-incorporated and you get a soft, crumbly mixture, with a few small bits and pieces of peanuts still visible. It’s ready when you can pinch the mixture between your fingers and it holds together. Pour this mixture into the prepared baking pan. Press down and smooth into a tightly-packed, even layer. Freeze for 20-30 minutes, until very firm. 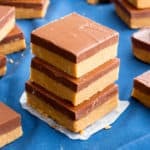 Remove from freezer and slice into 18 bars. Enjoy! Storing instructions below. 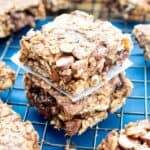 - Adapted from my No Bake Chocolate Pecan Bars. - Store in an airtight container at room temperature or the refrigerator for 1-3 weeks. 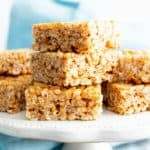 - Freezing instructions: store in an airtight, freezer-friendly container for 1-2 months. Allow to thaw for 5-10 minutes before enjoying. 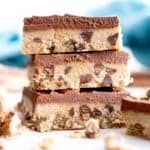 - More No Bake recipes (all V, GF, DF): no bake peanut butter coconut cookies, no bake almond joy energy bites, no bake chocolate almond butter bars (paleo). Those look yummy! Did you use a 9×9 or a 9×12? These look SO GOOD. I can’t wait to try – thank you!! Are the peanuts roasted or raw? Hi Bharti! The peanuts are roasted. Enjoy! 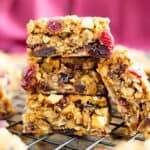 How about Diabetic Friendly Bars /Cookies? 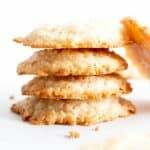 Not too sure about all fruit, but what about trying Truvia or similar sweetners in your recipes? please. 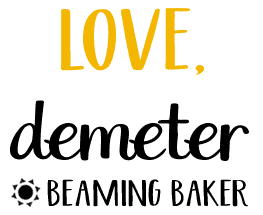 Please delete my name from my requests, Demeter. Hi I got it like too sticky…how to fix that?? Hi Kirthi, did you ever get to the “wet sand” stage of blending? Also, did you soak your dates before making these?